Dr. Lynne Curry's groundbreaking book, Beating the Workplace Bully is being published by AMACOMm and is available for pre-order through both Amazon and Barnes & Noble. With this practical, personal coaching program in your corner, you can reclaim your power-- and defeat the office bully once and for all. 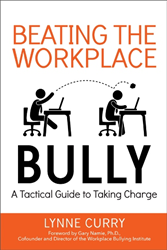 Beating the Workplace Bully is in the publishers hands and already has garnered attention. Dr. Gary Namie of the Workplace Bullying Institute has endoresed the book by writing a glowing foreword. The book has also been picked up by Brilliance Audio to be offered as an audio book. "Bullies aren't limited to the playground. These days, they roam our offices and can be found everywhere from break rooms to boardrooms. They don't steal your lunch money, but they can make your work life a living hell--and even ruin your career. Whether the bully is a boss or a coworker...whether you're the target of manipulation, intimidation, verbal abuse, or deliberate humiliation, "Beating the Workplace Bully "will show you how to fight back. Filled with exercises, assessments, and real-life examples, this empowering guide helps you recognize what's been making you a victim...and reveals how to: Avoid typical bully traps - Remain aware and in charge - Move past your fear - Calm yourself in any confrontation - Keep your dignity intact - Build confidence - Handle sneak attacks - Strengthen your resolve - Understand the steps that your employer or supervisors can take to address the issue - Combat cyberbullying - And more with this practical, personal coaching program in your corner, you can reclaim your power--and defeat the office bully once and for all."